Score! 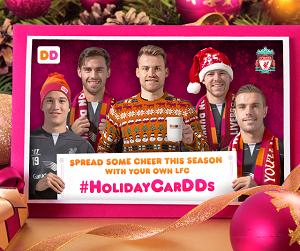 Dunkin’ Donuts and Liverpool FC Holiday eCards are coming your way! Are you ready to celebrate the holidays with Dunkin’ Donuts and Liverpool FC? We cannot wait to spread some holiday cheer with our new LFC #HolidayCarDDs! Throughout the month of December, we will be sending fans holiday inspired eCards via Twitter that feature some of Liverpool FC’s top players. Think you’re on the nice list this year? Tweet to @DunkinDonuts and @LFC using the hashtag #HolidayCarDDs to give the team some love this holiday season in order to receive your own eCard! These eCards are a great way to spice up your holiday season, and a new design will come out each week leading up to the holidays! Make sure to follow @DunkinDonuts and @LFC so you don’t miss any of the holiday fun!